A landscape project at Oquirrh Hills Golf Course along the right side of the 17th fairway was recently completed by Broken Arrow Construction. It only took about three weeks for Broken Arrow, Inc. to complete a donated, major landscaping project on the 17th hole fairway at Oquirrh Hills Golf Course. Tooele City Parks and Recreation officials say the same project would have taken them two years to complete with only a small crew available. 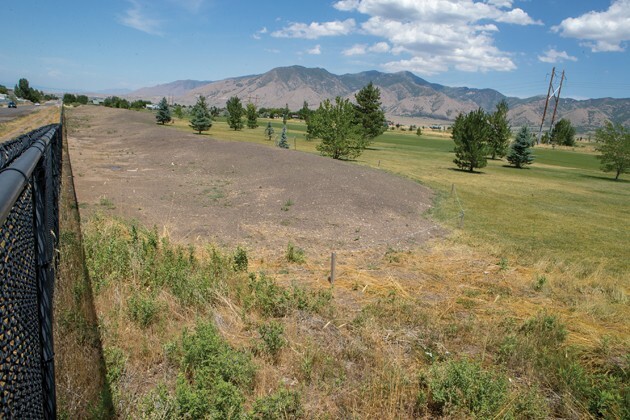 Tooele City Parks and Recreation Director Brian Roth said his department had been working on a mound-building project for several years on the 535-yard, par-5 17th hole fairway. The mound would be 325 yards long and 40-60 feet wide with a total area just over one acre, Roth said. Eventually the mound would be seeded with grass. Roth said several Broken Arrow employees with equipment (skid steer, mini excavator and dozer) came in during June 11-15 and worked to finish grade and cap the area with top soil. Then on June 21, about 70 Broken Arrow employees showed up with rakes and shovels. The seeding was completed on July 2. The project is part of a new tradition for Broken Arrow of providing a “day of service” each year at no cost to the recipient, according to Cari Watson, company human resources director. The golf course project is expected to be the first of many to come. Watson said the project was coordinated by Jared Bunn, Broken Arrow senior vice president. Broken Arrow is a multi-faceted construction company that specializes in excavation, providing road salt and de-icing salt, commercial roofing and installing fire protection systems. The company employs 130 people with offices in Lake Point, Arizona and Wyoming, Watson said. The company has completed many jobs throughout the Intermountain West during its 46 years of operation. Tooele City recently awarded a contract to Broken Arrow on June 6 for $46,540 to repair the Pratt Aquatic Center roof. The company has also been doing a culinary water project on 100 East this summer. That project cost is $824,000.